Lucky Princess Cleopatra Superchill the Staffordshire Bull Terrier has had a life of luxury that includes 65 outfits and 175 pairs of sunglasses and even a bespoke £1,500 pram so she doesn’t get her paws dirty. 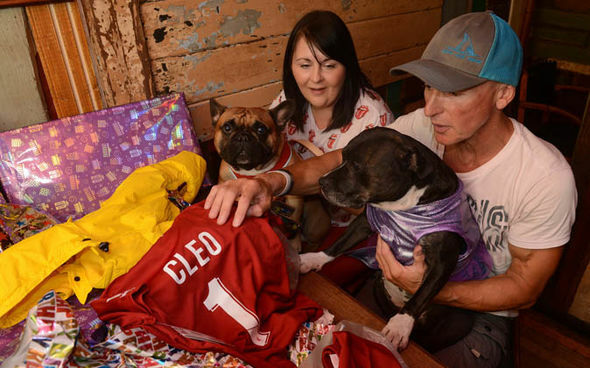 The spoiled staffie has just celebrated her seventh birthday where her owner Anthony Welsh spent a further £1,000 on lavish gifts for the pooch he describes as his “daughter”. Cleopatra was treated to the finest tennis balls, a posh feeding station and her very own custom-made mountain bike in honour of her special day. She was then thrown her own beach party at the Marino Lounge dog-friendly cafe at New Brighton, on the Merseyside coast, along with her bulldog boyfriend, Frank, and Frank’s owner, Toni Green. They enjoyed doggy birthday cake, doggy steak and partied with balloons and presents – which she opened herself by ripping off the wrapping paper with her mouth. Owner Mr Welsh, 57, could not do enough for his delightful dog – named Cleo for short – and he loves dearly. With no partner or children, adorable black, white and brindle Cleo gets all of his attention. He said: “Cleo is just amazing, she really is one in a million. Superfit personal trainer Mr Welsh lives a clean and healthy life and spends time and money so Cleo can have the same lifestyle. She is exercised daily both on foot and on her own mountain bike, which is specially adapted so she can ride along. Mr Welsh buys only the best dog food for his pooch at around £40 a bag and Cleo has three kids’ sports cars – a 4×4, a convertible white sports car and a racing car, all at £500 each. The preened pooch – who even goes for regular manicures – rides around in her vehicles in her countless outfits for every occasion and a number of tiaras. Cleo, who Mr Welsh describes as his “world”, is given a daily massage and has songs sang to her when it is time to go to bed.